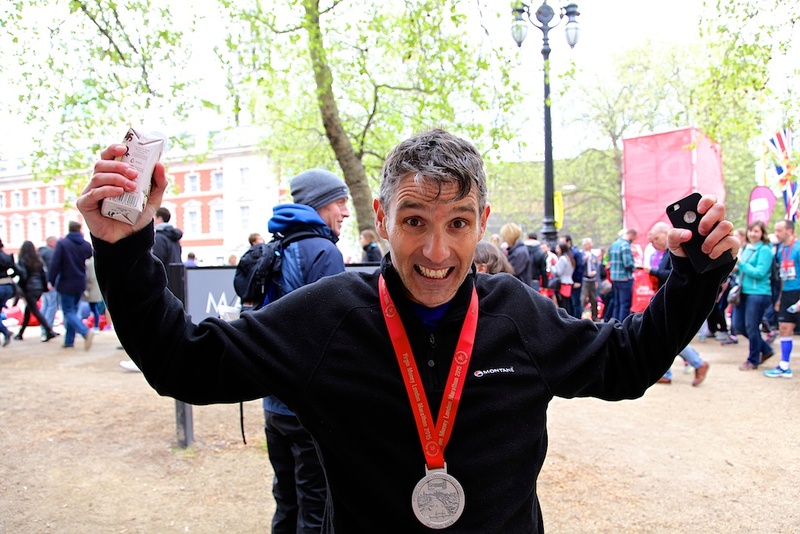 The Virgin Money London Marathon 2015 was my 15th marathon and ultra. In relative terms, I have not been a runner for very long. Sure, I ran at school and very occasionally as an adult I would get the shorts on and run a couple of miles. But it wasn’t until 2010 at the age of 40 that I really started getting interested in running regularly. Mid life crisis anyone? 2011 was a very special year. I got married, witnessed the birth of my fourth child, moved house, passed my English Language and Literature degree with First Class Honours and, to cap it all off, ran my first half marathon, in Bristol. I ran my first marathon a few months later in Paris in April 2012. I had never tried to enter the ballot for the London Marathon. I had never even considered running in the London Marathon until a couple of years ago. We’ve all heard the stories about how difficult it can be to get a place from the ballot but, like thousands of others, I duly submitted my entry in April 2014. I was amazed to find a magazine drop on to the floor in October which read “You’re in!”. The first time I’ve applied and boom, I’m running the Virgin Money London Marathon 2015! Fantastic. So began months of winter training. As a back up I had also entered the Paris Marathon, which has become tradition. I decided to run both marathons as there was a two week gap between them. Because I know the Paris course very well, I decided to make that my A race and to go out and enjoy the London experience. I really upped my training at the start of 2015 adding more running miles each week and increasing the cycling. I have a treadmill in the shed at the bottom of the garden which had become rather underused. However, once I upped my game, I found it very beneficial to jump on if I needed to get a few extra miles in and couldn’t leave the house for whatever reason. It’s a similar story with the bike. I have recently acquired a top end turbo trainer called the Wahoo Kickr which allows me to ride indoors whilst watching the computer screen. I can do a variety of things such as ride actual real world courses with video on screen. Or I can ride in virtual worlds like Zwift Island. Alternatively I can simply watch tv and have all my ride stats in the lower part of the screen as I follow a preprogrammed workout of hills and sprints. The bike trainer automatically adjusts the resistance to simulate climbing a hill or riding on the flat. It is awesome. April duly arrived and I was very pleased to knock over 2 minutes off my previous marathon PB by getting 3:16:07 in Paris. However, this left me with a bit of a conundrum. 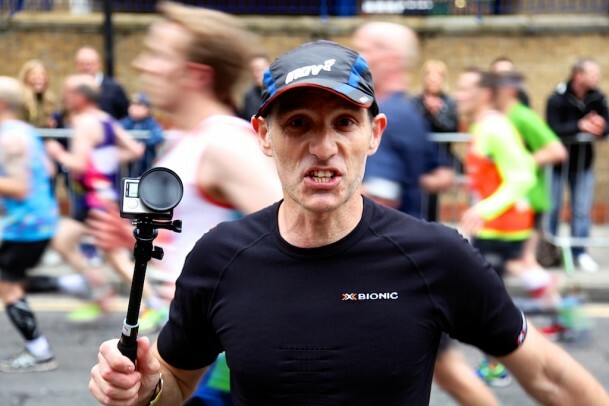 Had I run 1 minute and 8 seconds faster in Paris then I would have achieved the 3:15 qualification for the Boston Marathon and a Good For Age entry for the following year’s London Marathon. 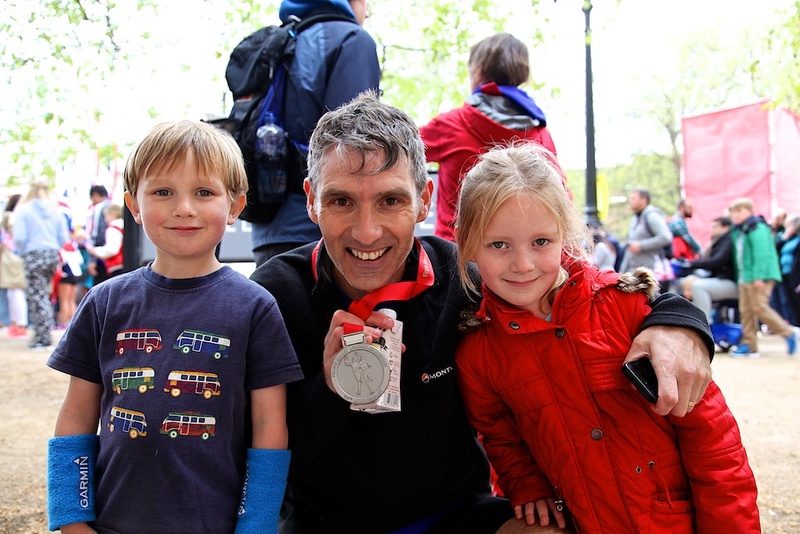 I really felt I could run 3:15 and so, rather than take it easy and loll round, I decided to go for it again in the Virgin Money London Marathon 2015. However, I was determined to enjoy the experience too and my heart was set on filming the event as I ran. Filming and running at speed have not worked out so well in the past but I was stuck between two places and made the decision to not worry about it too much. We booked a hotel in Bexleyheath for the night before, thinking this would help with preparations, allowing me to get an early night and not to have to travel too far in the morning. Unfortunately, I was then booked to work on the Saturday night at a Wedding Anniversary party in Hastings. I couldn’t turn the money down, so once we had been to the Expo to get my race number, I left Victoria and the children and travelled on the train back down to the coast to work. I got back to the hotel at 11pm and went straight to bed. Not quite the relaxing evening I had hoped for. I woke on marathon day feeling pretty good. Pre race breakfast was a Steve Way style jam on toast. I used to carb load in the days before a marathon and on race morning, but I don’t do that anymore. I eat a normal diet, although probably lighter on carbs and heavier on protein and I have a very light breakfast on race day. I carry two sachets of Ella’s Kitchen baby food with me during the race and consume one at 9 miles and the other at 19. This is still experimental though and is subject to change! Foolishly I forgot my throw-away jumper when I left the hotel. So prior to the race I was getting quite cold. The weather was cool and overcast, great for running, but not so great for standing around in a thin top. I caught the train from Bexleyheath and alighted at Blackheath some 20 minutes later. It was very easy and I think we will do exactly the same again should I ever do another London Marathon. I joined throngs of people making their way to the Blue Start on the common. 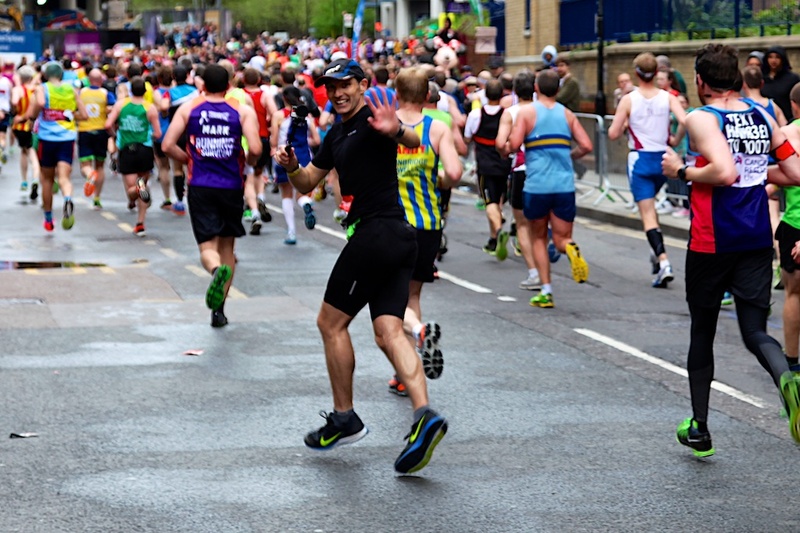 There were three starts at the Virgin Money London Marathon 2015. Red, is the mass start. This is the one you see on the TV with thousands of runners stretching miles back and the one from the first 1981 race. Green Start is for those who have qualified with GFA or Championship times. I was at the Blue Start, which is for ballot entries and also where the women, wheelchair and elite athletes start. It’s probably the best start line because there is a grandstand of supporters to cheer you off, unlike the other two start lines. The only thing is you don’t quite get the feeling of there being thousands of people, which I imagine you would at the Red Start. I would have to rate the Paris Marathon way ahead here for excitement at the beginning, what with everyone starting on the huge wide avenue that is the Champs Elysees. I managed to procure a couple of bin liners to protect me from the wind and spent the hour I had before the race start, drinking coffee and wandering fairly aimlessly around the start area, filming the various goings on. Had it been sunny, I imagine I might have enjoyed this part of the day a little more. As it was, I just wanted to get on with it. Back in April 2014 I had predicted my finish time to be around 3:30 and was subsequently given a number which related to a starting pen a little further back than I wanted. A little charm ensured I managed to worm my way in to the pen in front. Race time was 10:10am. I took my bin liners off at the last minute, started the camera and off we went. The first few miles of settling in were quiet and fairly uneventful, apart from the hilarious people with huge packards shouting HUMP!!! every time we ran over sleeping policemen in the road. They must have had a serious lawsuit at one time to feel they have to warn everyone so vociferously! It began to get exciting as we passed the military buildings at Greenwich. The crowds gathered and the noise increased. It got louder and louder, busier and busier until we reached a crescendo at Cutty Sark. This was possibly the highlight for me of the whole race. Rounding Cutty Sark to the noise of the huge crowds was something I won’t ever forget. I think being my first experience of it and the first time during the run, it had more of an impact upon me. My race plan was to go out at 4:30 per kilometre and keep it up as long as I could. In the unlikely event that I kept it up for the whole race, I would come in under 3 hours 10 minutes. At 10 kilometres I was easily on course. The next few miles follows the line of the Thames through Surrey Quays before arriving at Tower Bridge. Friends had told me that crossing Tower Bridge in the London Marathon is something very special, and it was. Again, the crowds are huge, the noise is immense and the feeling of elation is almost overwhelming. 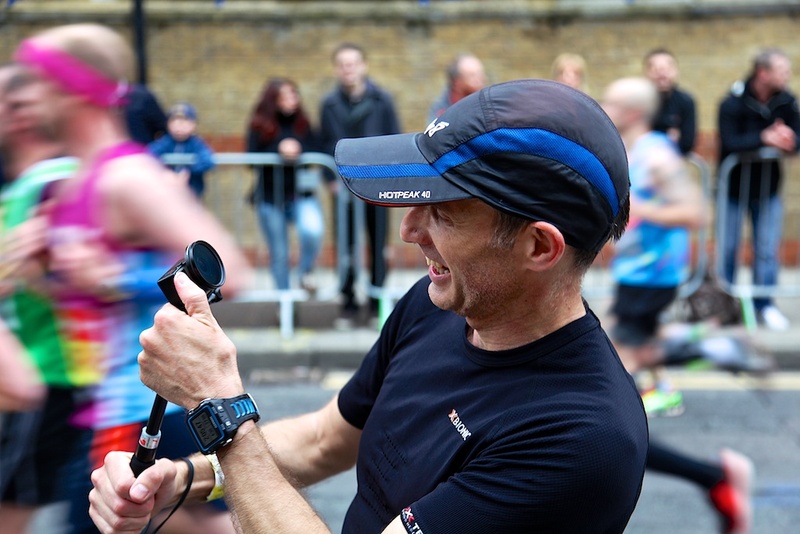 I’m so glad I filmed it all as, even if I do a hundred more London Marathons, I’ll always look back with fondness at my first. Once you are over Tower Bridge there is the Tower of London to your left and then it’s off back out again towards the Isle of Dogs. At this point, some 12 miles in, I was still on course. Pacing was a little up and down to be honest and I did get carried away a few times with filming at playing up to the crowd. There were a few kilometres slightly quicker than they should have been in the middle of the race. Miles 13 though 16 are run on the right hand side of the road. On the other side is the return route and, luckily for me and my camera, as I passed 14 miles the lead pack were coming at me in the opposite direction. Having started at the same time only about 100 metres in front of me, the leaders were now some 7 miles ahead! By 16 miles I was starting to feel like I needed to stop for a wee. I was beginning to tire a little. At 17 miles I did stop. Unfortunately my wee seemed to go on forever and I’m sure I added at least a minute on to my time at that point. Then, just a few metres further along I saw my wife and children at Coldharbour. I stopped again briefly to give them and kiss and cuddle and got going again. With hindsight that definitely cost me a couple of minutes and it also served to break my rhythm. I’m not saying I would have been able to keep the same pace all the way but I think it had a negative psychological effect rather than the positive boost one might expect from seeing your family. Once we turned for home at 20 miles I was starting to slow significantly. I was technically still on target but by now I couldn’t keep it up. If you have a look at my pace analysis you can clearly see where I stopped and the drop off following it. Certainly the effort in Paris may well have had an effect on my hitting the wall at 20 miles, but I have not been so diligent with my fat burning regime of late and the odd roast potato and sandwich may have crept in to my diet, meaning my body is less fat adapted now than it was a few weeks ago. I didn’t finish my second sachet of baby food. I think it was a mistake to take two sweet fruit sachets. Next time I will take one sweet and one savoury. I pulled myself back past the Tower of London and along Embankment hitting 40 kilometres in 3:07. Rounding the Palace of Westminster and heading up Birdcage Walk was pretty special and it was at this point that I was spotted on TV by a friend. It’s a darn good spot because I’m only on for a few seconds and pretty well surrounded by other runners. I managed to raise my game for the final mile and I remembered to thoroughly absorb the experience as I ran past Buckingham Palace and down the Mall. It is a little odd that for large sections on Birdcage Walk and down the Mall it is boarded off, so spectators can’t see the runners. There is a grandstand at the end and lots of people around the Victoria Memorial outside the palace. But it would be much better if the crowds in St. James’s Park could see us too. I would have loved to come in under 3:15, but it didn’t happen today. I crossed the line in 3:18:30. My second fastest marathon ever, so I am not too disheartened. Looking back there were certainly things which contributed to the lost 3 minutes 30 seconds. Having to work the night before, running a full marathon at pace two weeks earlier, stopping twice at 17 miles, going a little too fast early on, carrying a camera, being very cold at the start and not quite nailing the diet, all had a combined effect on my finish time for the Virgin Money London Marathon 2015. Once finished you make your way through to receive your medal and goodie bag. You collect your bag of belongings from the numerous lorries lined up down the middle of the Mall and eventually you come out at the bottom of the Mall and turn right to the meet and greet area by Horse Guards Parade. Unfortunately my wife and I had a mix up. She had been standing at letter C and I suggested we meet at letter S, but as she hung up I changed my mind and said it was ok, I would come to her at C. She didn’t hear this and went off to S. Consequently I was waiting ages at C getting colder and colder. We eventually sorted ourselves out and I spent a good hour in Caffe Nero in Trafalgar Square, warming up and rehydrating. 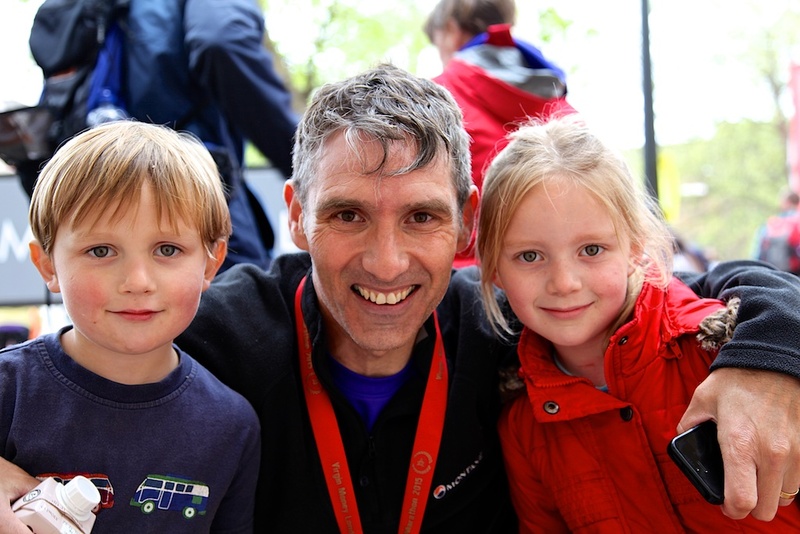 Apart from being freezing cold at the beginning and the end of the race, my Virgin Money London Marathon 2015 experience was everything I had hoped it would be. Fantastic crowd support, a true mass participation event, the full spirit of British eccentricity on display and a whole heap of iconic sights. Add to that a pretty decent time and I am well chuffed with the whole day. I am in the ballot for the 2016 running of the event and who knows, regardless of the fact that the chances are even slimmer this year, someone has to get a magazine with “You’re in” on the front. It could be me and it could well be you. Good luck if you’re in the ballot. If you get it it may well be the most enjoyable marathon you run.